BARA, Jan 20: An outstanding performance from Sankata Club goalkeeper Raja Babu Thapa helped the A-Division League runner-up defeat another first division outfit Saraswati Youth Club in the ongoing 10th Simara Gold Cup football tournament in Simara on Saturday. With the win, Sankata has advanced into the quarterfinals. 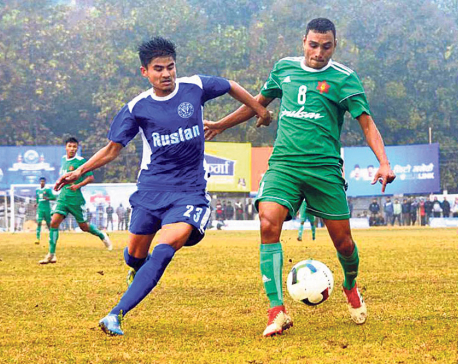 At the Simara Stadium, Sankata defeated Saraswati 3-1 in the tie-breaker. The game was pushed into the tie-breaker after the regulated time finished with a 1-1 draw. 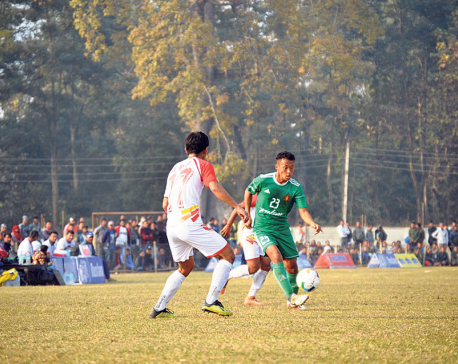 Saraswati was the team to take the lead first in the game as Mohan Gurung scored in the 38th minute. But, Saraswati conceded early in the second half in the 58th minute as Jaya Gurung scored for Sankata. Sankata keeper Raja Babu Thapa saved three Saraswati spot kicks and was also named the man of the match for his performance and got Rs 10,000. He saved Victor Amobi, Ramesh Ghising and Dipak Gupta. Only Gurung scored for Saraswati. Laxman Ruchal, Suraj Gurung and Roman Limbu scored for Sankata, while Amit Tamang missed his kick and Dipesh Ale Magar’s shot hit the cross bar. Sankata, who is the winner of the eighth edition of the tournament, will now take on Three Star Club in the quarterfinal match. 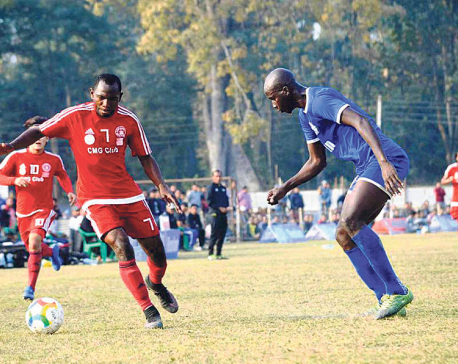 The departmental teams Armed Police Force (APF) Club and Tribhuvan Army Club will face each other on Sunday.